After the events of DARK NIGHTS: METAL and JUSTICE LEAGUE: NO JUSTICE, it was clear that Scott Snyder’s work on JUSTICE LEAGUE wasn’t likely to be small. Yet, since taking over writing duties on the book when it relaunched last summer, Snyder and his art and writing collaborators have been remarkably patient with their storytelling. 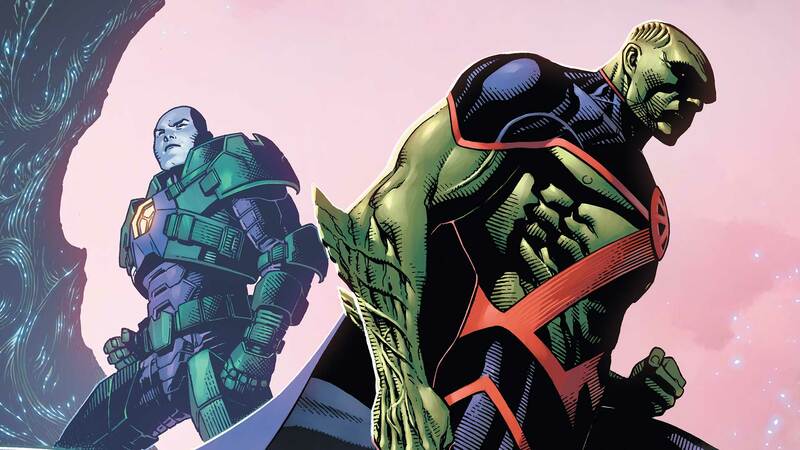 Things have been set in motion, and the Legion of Doom has risen to once again become one of the biggest threats in the DC Universe, but mystery still abounds. What happened to the Source Wall? Who is this mysterious being that crashed on earth in the Totality? How many more energies will the Legion of Doom unlock? And how does Lex seem to know so much about all of this? Read on for some intriguing answers and insight into one of the biggest Justice League stories this decade! Let’s start with where things left off in JUSTICE LEAGUE #15. We’ve been getting shadowy references to Perpetua for a bit, but now we finally know her name. What can you tell us about her? We’ve been building this mystery since issue #1 of Justice League. It actually goes all the way back to Dark Nights: Metal. Josh Williamson, James Tynion and a couple of other writers and I developed the plan around the end of 2016. We were building Dark Nights: Metal, and it included this big extended story that was going to run in 2018 and 2019, if Metal went over well enough with people. Perpetua is a being who was seeded into the mythology that we introduced then. The Monitor, Anti-Monitor and World Forger are some of the oldest celestial beings in the DC Universe, and they’re brothers. Perpetua is essentially the being that created them—she’s their mother. There’s a history between them that’s very dark. It has a lot of twists, turns and conflict that we’ll be revealing very soon. There’s a reason why she was imprisoned in the wall with all of her minions, and a reason why they turned on her. It’s this giant cosmic soap opera that we’ve been building to for year, and that we’re really excited about finally revealing. She’s right at the center of that. Justice League #16 is kind of a crucial issue, then, isn’t it? You’re finally starting to dive into all of that. Yes. Issue #16 almost serves as a skeleton key or a Rosetta stone for our series. Issue #16, the JUSTICE LEAGUE ANNUAL and issue #17 are almost the trifecta of revelations about the mythos that we began creating in Metal that’s being further explored here. From the nature of the totality, the being inside of it, Perpetua, her history, her relationship to the DCU, her relationship to the other celestial beings—all of that starts to be revealed in big ways in #16, then it’s further explored in the annual and then brought to bear on Lex and Martian Manhunter in JUSTICE LEAGUE #17. For us, this is the beginning of a lot of revelatory moments in the series. There are also the seven energies of creation, and their darker sides. We’ve seen some of these, but not all of them, right? Will we be seeing more? They’re the opposite energies from the positive forces that a lot of our heroes wield. So, the Speed Force has its opposite in the Still Force, the emotional spectrum has its opposite in the invisible emotional spectrum and so on. So far, Luthor has unlocked four out of the seven. By the end of the annual, he will have unlocked almost six. The final force—the seventh force—is the subject of a lot of the stuff we’ll be doing over the summer. Little by little, with each force he unlocks, he brings Perpetua closer to being revived and fully restored and empowered. His goal is to bring her back because we learn in issue #16 that the multiverse was formed once before by her in a way that was abominable and kind of unnatural. Humans were not what they are now—they were a mix of different DNA, including Martian and other species. They were a perfect predator that would never die. Under Perpetua’s watch, she had created this sort of beautiful proto-universe in which we were the favorite sons. But ultimately, when her sons turned her in to her kind, saying this wasn’t what she was supposed to do, she was imprisoned in the Source Wall forever and the multiverse was restarted in a more natural way—where the seven positive forces govern it as opposed to the seven negative forces that she used to create her proto-universe. That’s basically the entire mythos as we’re reviewing it. Just to clarify something, the Justice League is about to learn all of this, but Lex has seemed to be aware of it for a while. Has it ever been revealed where he got that from? That’s exactly what’s revealed in Justice League #17 and #18. They tell the story of how Lex came to know what he knows, his father’s relationship to it through the Legionnaire’s Club and the sort of history he’s learned. Well, his version of it. Between issue #16 and #18, every secret is unveiled. It was great to get a story where Hawkgirl was really at the forefront. Kendra’s come a long way since Dark Nights: Metal. How important is she ultimately going to be? She’s hugely important. Kendra and Carter Hall both, but especially Kendra. When I started Metal, the Hawks became a real touchstone of lore and mythology, and I fell in love with those characters. I had ambitions, actually, to write a Hawkman series long ago, but I just couldn’t make it work with all of the things I was already writing for DC. But I have a tremendous love for both characters and the historical mystery that lies behind their reincarnation. I wanted to use Kendra in a way that was new, while still honoring the great work done by Geoff Johns and others with her in the past. She’d have the history that we know, and yet it would be built upon in ways that you didn’t expect. Here, what we learn is that Kendra isn’t just a being who was reincarnated because of Nth metal. We start to learn that there’s a pattern to the lives that she’s lived. We start to learn that her spirit might be much older than she ever realized, and it might play a part here. What we start to really get is that Kendra’s role, just like Martian Manhunter’s role, is much more crucial to the bigger story of the multiverse and what’s going to happen to it than she ever realized. Honestly, the stars of the series to me are her and Martian Manhunter more than anyone else. Certainly, other characters get their time in the spotlight—Superman has a really big story coming up. But in the end, Kendra and J’onn, and their relationship as it’s cemented going forward really comes from this shared experience in the series where they both discover that the roles they thought they played in their own mythologies wind up being radically different than what they thought. In that way, they both find themselves thrust into the middle of a much bigger drama than they ever thought they would be involved in. That brings them together. Looking at a slightly different corner of things now, your other big series is THE BATMAN WHO LAUGHS, which seems like it’s going to have some pretty big implications for not just Batman, but the entire world before it wraps up. Can we expect that to affect Justice League? I really want The Batman Who Laughs to function as something you can read singularly. I want you to feel as though if you picked it up outside of Justice League or Metal, you’ll get one of my best books, and it will feel complete in and of itself. At the same time, it actually has something that happens at the end of it that winds up creating tremendous story for the DCU that funnels back into Justice League. So, for us, the trick is having it be something you can read individually, and yet, also let fans know that it’s important to read it if you’re interested or excited about seeing the bigger tapestry that we’re weaving over the DCU. It’s both in that way. It’s meant to be a really strong standalone, and yet, I can promise to anyone reading this that the repercussions from that book will have a huge, explosive impact on the DCU. One of my favorite new additions to the DC Universe has been Jarro. Where did that idea come from? I hope we’ll be seeing more of him! I just loved writing Starro, so when we decided to kill him in No Justice, I sat wondering how we could bring him back. The idea of a fragment of him regenerating, being almost like a tiny, more sensitive version of the same character just appealed to me. Everyone at DC thought I was crazy to try it, but I just fell in love with the idea and was really adamant about it. He has big moments coming up in issue #20. You see this fantasy sequence where Jarro and Batman are chasing Deathstroke together. Jarro has a little Robin outfit on, and he throws Jarro at Deathstroke, and Jarro takes him down. Batman is like, “You were always my favorite Robin, Jarro.” It’s my favorite scene in a long time. The two of them actually do develop a bond that I hope people see as touching. I think Batman finds it weirdly easier sometimes to talk to Jarro than he does to his own children. So, what other cool things can you tease about where things are going in Justice League? I would just say that we’re building towards some really special storylines. We’re going to the sixth dimension in a big arc by me and Jorge Jimenez that starts in issue #19. We bring Mr. Mxyzptlk back, along with Bat-Mite and others. We go to the dimension in which the giant celestial beings exist, and it’s almost like the control room of the multiverse. That really builds to the biggest stuff we’re going to do on this series. Everybody’s going to get a moment. We have that Jarro issue coming. We have a small, but I think pretty poignant arc about Wonder Woman. We bring back Aquaman in a role that I think you wouldn’t expect. We have a lot of touchpoints and big moments coming that we’re really thrilled about. JUSTICE LEAGUE #16 by Scott Snyder, James Tynion IV, Jim Cheung, Stephen Segovia, Mark Morales, Tomeu Morey and Wil Quintana is now available in print and as a digital download. For a preview of the issue, click here.